Too much sitting: a novel and important predictor of chronic disease risk? Research on physical activity and health has pointed clearly to increasing the time that adults spend doing moderate to vigorous intensity activities: 30 minutes a day is generally recommended. However, recent evidence underlines the importance of also focusing on sedentary behaviours—the high volumes of time that adults spend sitting in their remaining “non-exercise” waking hours. We provide a brief overview of recent evidence for the distinct relationships between ‘too much sitting’ and biomarkers of metabolic health and, thus, with increased risk of type 2 diabetes, cardiovascular disease and other prevalent chronic health problems. Particular concerns for this new field include the challenges of changing sedentary behaviours in the context of ubiquitous environmental and social drivers of sitting time; examining the effects of interventions for reducing or breaking-up sitting time and identifying the most relevant implications for clinical and public health practice. Increasing participation in leisure time physical activity (LTPA) in adult populations is a central tenet of strategies for preventing major chronic diseases (type 2 diabetes, cardiovascular disease, breast and colon cancer) and obesity in developed and developing nations.1 2 To date, clinical practice, community programmes, mass-media campaigns and population strategies have focused mainly on encouraging and supporting individuals to be more active, largely during discretionary or leisure time, but more recently (and to a lesser extent) also in travel time.2 While these approaches have met with some success, our recent body of work has identified sedentary behaviour (time spent sitting) as a novel and potentially important risk factor for the development of chronic disease. Even if people meet the current recommendation of 30 minutes of physical activity on most days each week, there may be significant adverse metabolic and health effects from prolonged sitting—the activity that dominates most people’s remaining “non-exercise” waking hours. As population levels of overweight and obesity continue to increase, and chronic health problems from inactivity become increasingly prevalent, there is now an imperative to increase population levels of overall total daily energy expenditure. However, discretionary participation in moderate to vigorous physical activity is insufficient to raise energy expenditure as much as is necessary for population-level obesity prevention.3 Objective data derived from a recent accelerometer study,4 in which physical activity was measured objectively (as opposed to being self-reported), show that adults, on average, spend more than half their waking hours in sedentary activities (primarily prolonged sitting). 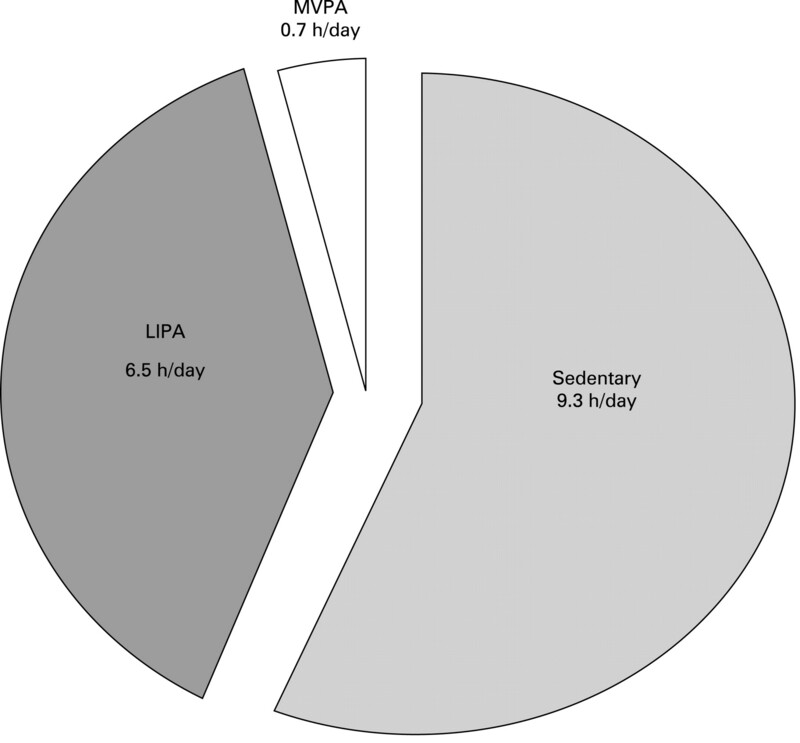 The remainder of the time is spent in light intensity physical activity (LIPA; predominantly standing with some ambulation) and only about 4–5% of the day is spent in moderate to vigorous physical activity (MVPA) (fig 1).4 It is clear that if sedentary time decreases, then time spent in LIPA or MVPA will increase. While the metabolic and health consequences of actual shifts in sedentary time relative to LIPA and MVPA are currently unknown, new evidence now suggests that such challenges need to be addressed. Compelling recent evidence emphasises the need to influence sedentary behaviour—to limit excessive sitting—and to reduce its likely health consequences. This will involve very different approaches from those needed to increase LTPA, such as exercise prescription. The behaviour of sitting time occurs in different contexts, including sitting for transport, at work, at home and in leisure time. It also requires that researchers determine the quantum of the increase in total physical activity (LIPA or MVPA) that would be required to achieve better health outcomes and prevent obesity and identify how best to go about achieving such changes. Figure 1 Objectively measured distributions of moderate to vigorous physical activity (MVPA), light intensity physical activity (LIPA) and sedentary time during adults' waking hours. More than two-thirds of the mid-age population in developed countries like the UK, the USA and Australia is now overweight or obese, which poses additional significant health risks for this generation.13 Also, about 6% of children are also now obese14 and this obesity is likely to track into adulthood.15 Both overweight/obesity and physical inactivity in mid-age are strong markers for the development of non-communicable disease over time.16 17 Thus, reducing sitting time may have at least as important a role as promoting physical activity in maintaining healthy weight and in preventing further weight gain and improving chronic disease outcomes in mid-age adults; it is crucial for the future health of ageing populations. What is now needed is a broader, innovative approach to understanding and influencing sedentary behaviour in addition to increasing physical activity. This requires a paradigm shift, so that one thinks about the balance of sedentary behaviour and activity in all aspects of daily life, including transport, occupational settings, domestic work and leisure, especially around obesity management and the role of total physical activity in the prevention of further weight gain. This involves some re-orienting of the physical activity and health field from its well-established focus on LTPA to a comprehensive programme of research to understand the determinants of sedentary behaviour and both LIPA and MVPA. It will also involve studying the effects on health outcomes of shifting the balance of these behaviours towards more activity in all domains of daily life. Given the recent recognition of this phenomenon of too much sitting, there are not yet any recommended clinical guidelines. Commonsense might suggest that it may be prudent to try to minimise prolonged sitting with 5 minute breaks every hour. However, more specific advice will require dose-response relationships between sitting and health outcomes to be defined using controlled studies. Many of the possible interventions that encourage movement may well be undertaken in settings in which prolonged periods of sedentary behaviours are the norm. Research, policy and practice on physical activity and population health has focussed largely on increasing the time that adults spend doing moderate to vigorous intensity activities; 30 minutes a day is generally the target. However, recent evidence from biomarker studies and objective-measurement studies (and also from some prospective epidemiological studies) highlights the importance of focusing on the balance of light-intensity activities and sedentary behaviours—particularly the high volumes of time that adults in industrialised and developing countries spend sitting in their 15.5 “non-exercise” waking hours. A particular concern for this new research agenda is how to approach reducing or breaking-up prolonged sitting time, and how this might relate to increasing light intensity and moderate to vigorous intensity physical activities. Other research opportunities include carrying out studies on how best to promote higher volumes of overall physical activity (light intensity activities in addition to moderate to vigorous intensity activities), in the context of the ubiquitous environmental and social drivers of sitting time in occupational, transportation, recreational and domestic settings.
. Grand challenges in chronic non-communicable diseases. Nature 2007;450:494–6.
. Getting Australia active: Best practice for the promotion of physical activity. Melbourne: National Public Health Partnership, 2002.
. Leisure-time physical activity alone may not be a sufficient public health approach to prevent obesity—a focus on China. Obes Rev 2008;9:119–26.
. Objectively measured light-intensity physical activity is independently associated with 2-h plasma glucose. Diabetes Care 2007;30:1384–9.
. Changes in physical activity behavior and the development of body mass index during the last 30 years in Norway. Scand J Med Sci Sports 2008;18:309–17.
. Nonexercise activity thermogenesis—liberating the life-force. J Intern Med 2007;262:273–87.
. The road to obesity or the path to prevention: motorized transportation and obesity in China. Obes Res 2002;10:277–83.
. How active are young adult women? Health Promot J Austr 2002;13:23–38.
. Compendium of physical activities: an update of activity codes and MET intensities. Med Sci Sports Exerc 2000;32:S498–504.
. Determining energy expenditure during some household and garden tasks. Med Sci Sports Exerc 2002;34:895–902.
. Identifying the energy gap: magnitude and determinants of 5-year weight gain in midage women. Obes Res 2005;13:1431–41.
. Breaks in sedentary time: beneficial associations with metabolic risk. Diabetes Care 2008;31:661–6.
. Change in the prevalence of overweight and obesity among young Australians, 1969–1997. Am J Clin Nutr 2003;77:29–36.
. Are all Australians gaining weight? Differentials in overweight and obesity among adults, 1989–90 to 2001. Bulletin No. 11. AIHW Cat. No. AUS 39. Canberra: AIHW, 2003.
. Overweight and obesity from childhood to adulthood: a follow-up of participants in the 1985 Australian Schools Health and Fitness Survey. Med J Aust 2007;186:458–60.
. Adiposity as compared with physical activity in predicting mortality among women. N Engl J Med 2004;351:2694–703.
. Rose revisited: a “middle road” prevention strategy to reduce noncommunicable chronic disease risk. Bull World Health Organ 2007;85:886–7.
. Too little exercise and too much sitting: Inactivity physiology and the need for new recommendations on sedentary behaviour. Current Cardiovascular Risk Reports 2008;2:292–8. Funding: NO, AB WB are supported by NHMRC Program Grant funding (#301200); NO is also supported by a Queensland Health Core Research Infrastructure grant.